Between the installation of the implant and that of the prosthesis, it is necessary to count between 6 weeks and 4 months so that the implant is integrated perfectly into the bone of the jaw. In certain cases, the implant treatment is not indicated (quality and quantity of insufficient bone for example). It is to the dental surgeon of advising his patient. It is indicated when a tooth is devitalized or damaged. The facet (a fine ceramics plate) makes it possible to mask the anomaly while preserving a harmonious smile. 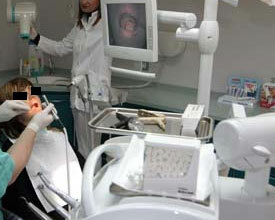 It is also possible to place facets on the front teeth to clear up a smile. It is done to the cabinet of the dentist in two meetings. Dental crown– Bridge - fixed Prostheses - removable Prostheses - Sine Top spin.